Traditional posole is always made with meat. Usually pork. However, my recipe is a quick, easy, and most importantly, tasty recipe that will make vegetarian and non-vegetarians alike very happy. And full. a) I realize I’m wandering dangerously close into Sandra Lee territory with all the canned ingredients. But, trust me, they work in this dish. However, if you’d like to use all fresh, be my guest. 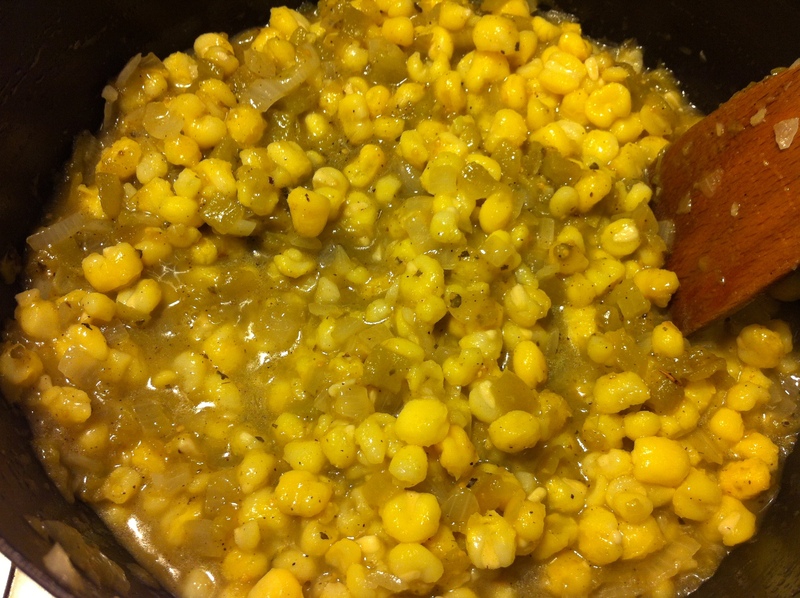 b) If you omit the cheese as a garnish and cook the hominy from dried, you can make this dish vegan. If you’d like to add some protein, use chicken broth and add some cooked chicken at the end. 1. Heat the oil in a large saucepan over medium high heat. Add the onions and garlic. Saute until the onion is soft, about 5 minutes. 2. Add the salsa verde and the chiles. Saute another 2 -3 minutes. Add the oregano, cumin, salt & pepper. Saute another 2 – 3 minutes. 3. 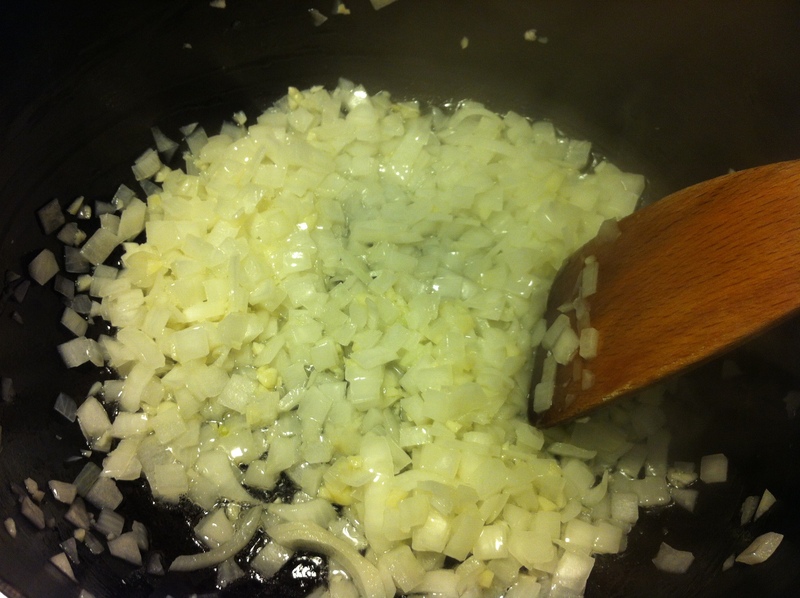 Add the hominy and saute for another 2 – 3 minutes. 4. 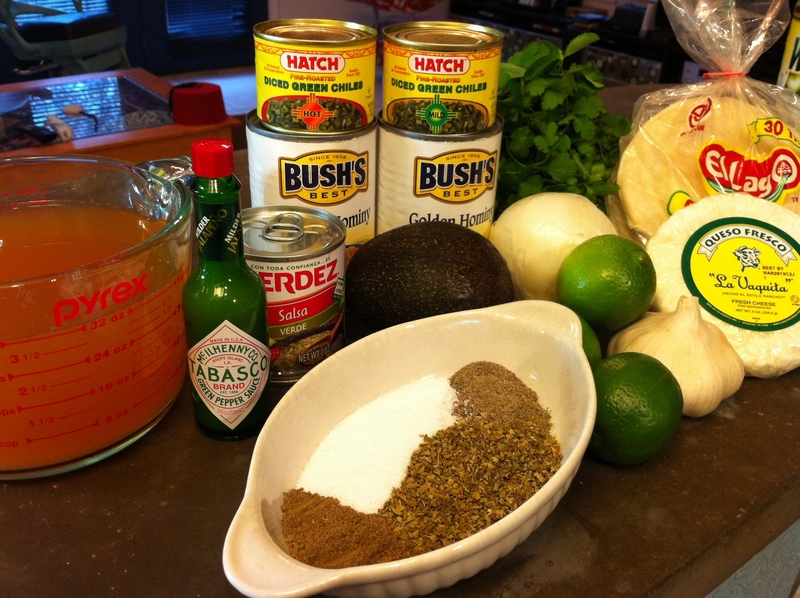 Add the vegetable broth and a few dashes of the green Tabasco. Adding the broth and Tabasco. Cover the saucepan and bring the broth to a boil. Uncover, lower the heat to medium low, and cook for 30 – 45 minutes. The soup will thicken slightly as it cooks. Stir frequently. Taste for seasoning after the first 30 minutes. 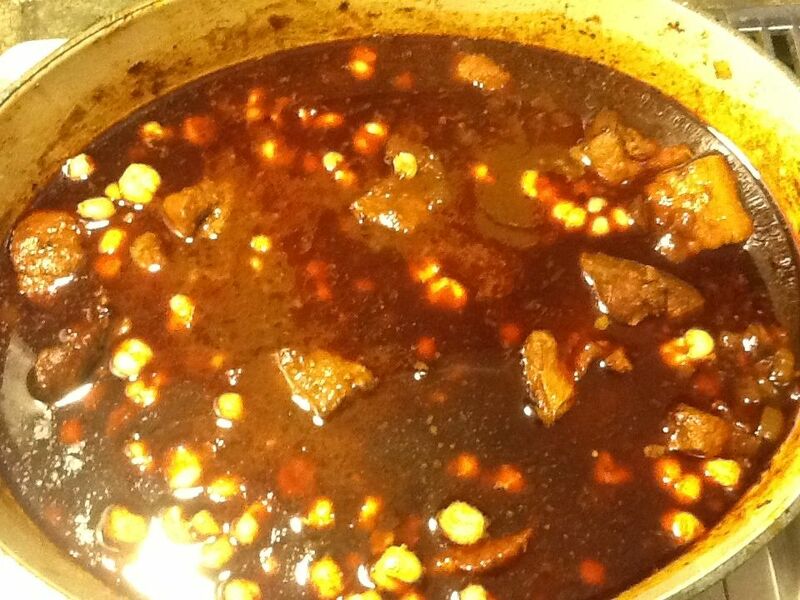 The posole after 45 minutes of cooking. It’s reduced and thickened slightly. 5. 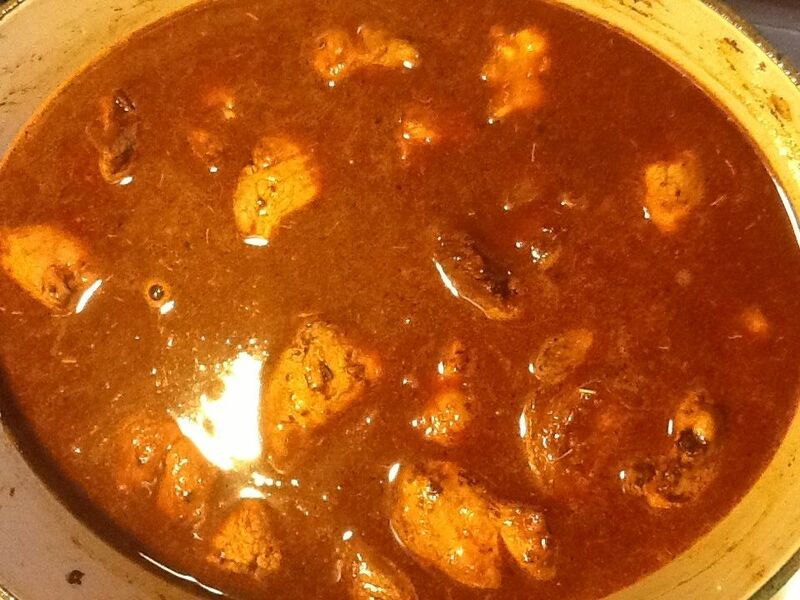 After the initial cooking time, add the lime juice and cook another 5 minutes. Taste the soup for seasoning. 6. 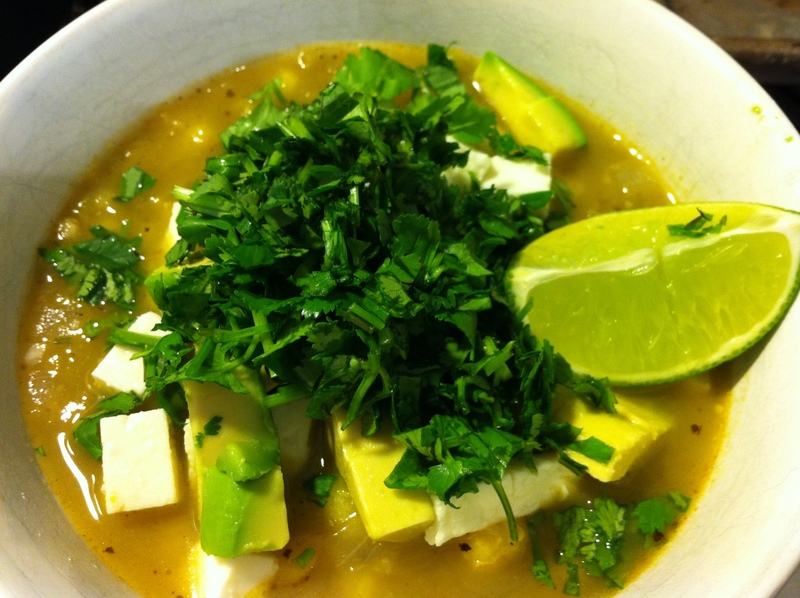 Serve the posole with queso fresco, chopped cilantro, chopped avocado, and more lime. Have heated corn tortillas on the side. The condiment tray. 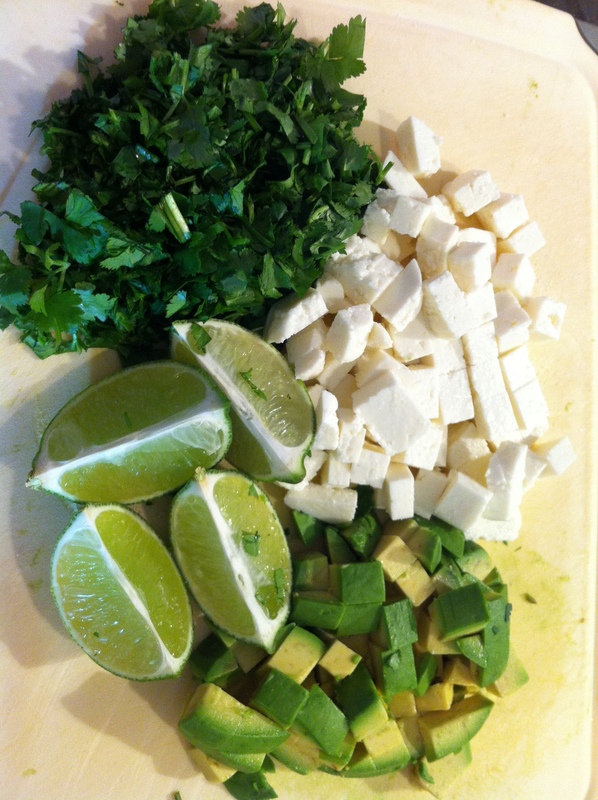 clockwise from top: chopped cilantro, queso fresco, chopped avocado, limes. Pozole, a word of Pre-Hispanic origin meaning “froth”, is a stew-like dish prepared with grains of a special corn called cacahuazintle (a very large kernel corn with a tough skin originally grown in Mexico) pre-cooked in a weak lye-water solution, making the corn grains lose their tough, fibrous outer layer so that they open like flowers when boiled, giving them the appearance of froth (what we now call hominy). 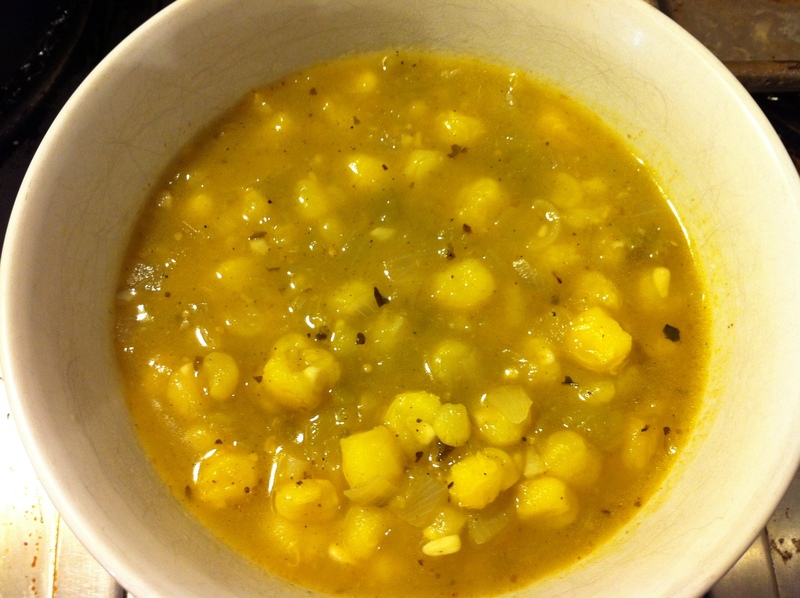 This corn is added to a broth with shredded chicken or pork. 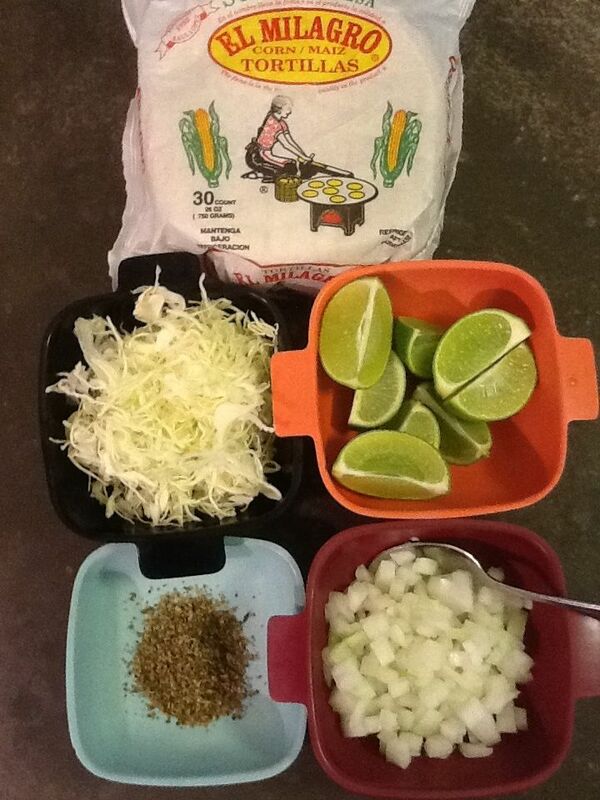 When serving, the usual condiments are chopped onion, limes, dried oregano, avocado, shredded cabbage, and tortillas. Different states of Mexico have made pozole their own. People in the State of Guerrero add tomatillos, Michoacán residents add pork rinds, Colima residents enjoy it with queso fresco (white cheese), and in coastal areas it is common to add sardines and other small fish. The best known recipe, however, is from Jalisco, prepared with pork and dried poblano peppers. Posole is usually served at celebrations, like birthdays, Dia de los Muretos (Day of the Dead), and Christmas. 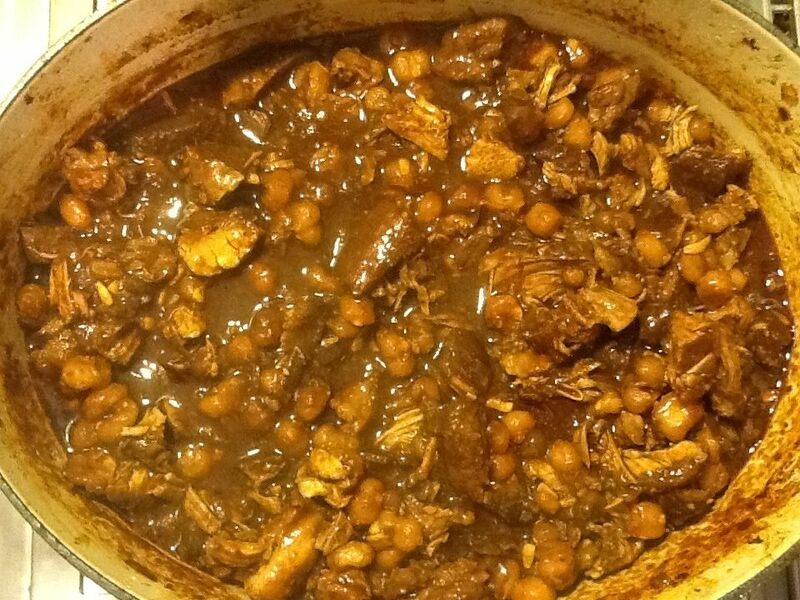 The Aztecs, however, had their own recipe for posole. During the celebrations in honor of god Xipe (the God of Agriculture and the Seasons), Emperor Moctezuma was served a huge pozole dish, crowned with the thigh of a sacrificed prisoner. In fact, the earliest history of posole states that the broth & hominy were cooked with the flesh of sacrificed prisoners. When cannibalism was outlawed, chicken and pork took the place of people. 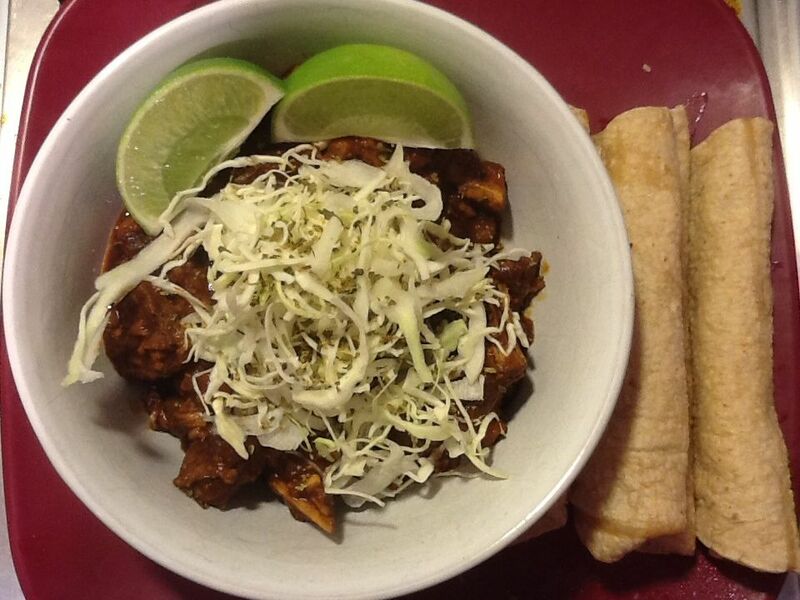 The style posole I make is the Jalisco style. I haven’t tried any of the other variations, but I’d bet the Michoacán style, with the pork rinds, is amazing. 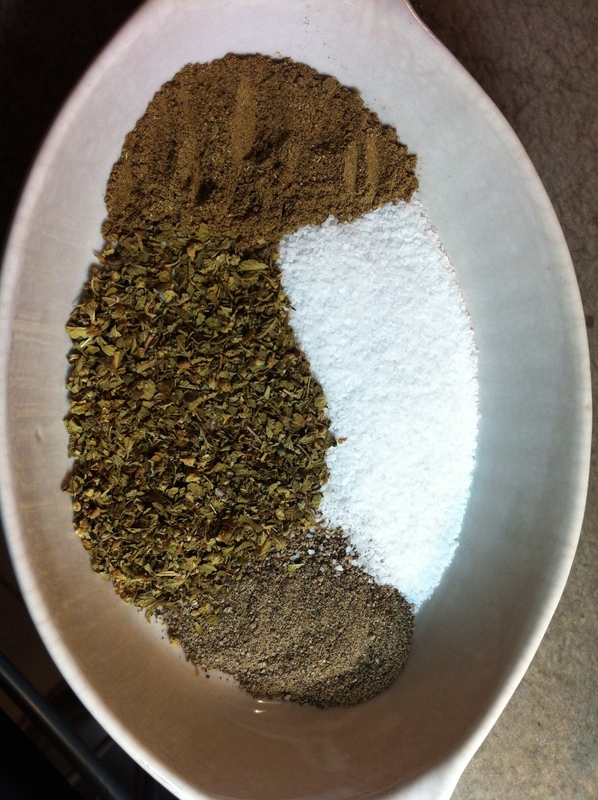 A quick note, I include quantities for both whole chiles as well as the powdered equivalents. I made this recipe with the powders. They are both equally good, but I find making the recipe with the powders easier and quicker. However, it is up to you. 1. Prepare the chiles: (If you have clean latex gloves, now is the time to use them.) Remove the stems and seeds from the chiles. Place them in a small bowl and cover with 2 cups of boiling water. Weigh down the chiles (a small plate will be sufficient) and let them soak for about 30 minutes. Remove the chiles from the soaking liquid and place them in a blender with just enough of the soaking liquid, if needed, to make a smooth puree. Set aside. *If you are using the chile powders instead, skip Step 1. 2. In a large stockpot or Dutch oven, heat the oil over medium-high heat. 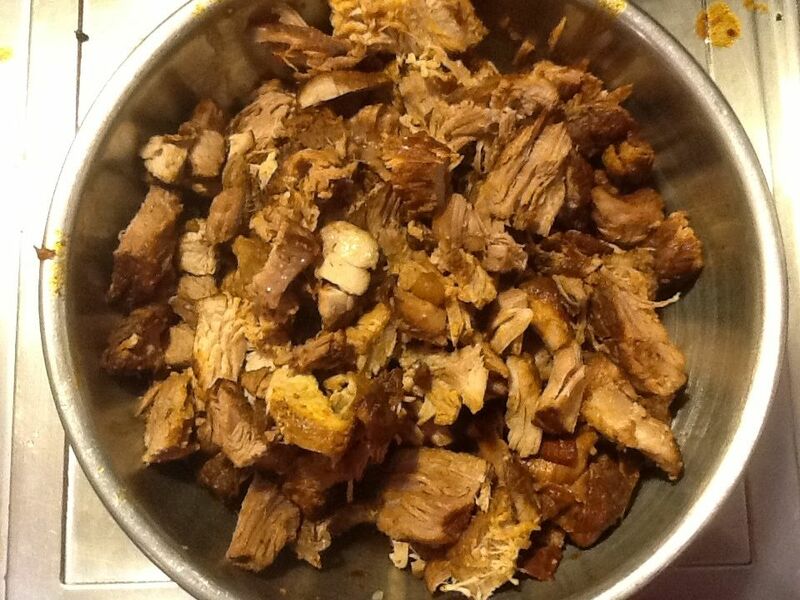 Brown the pork, in batches. 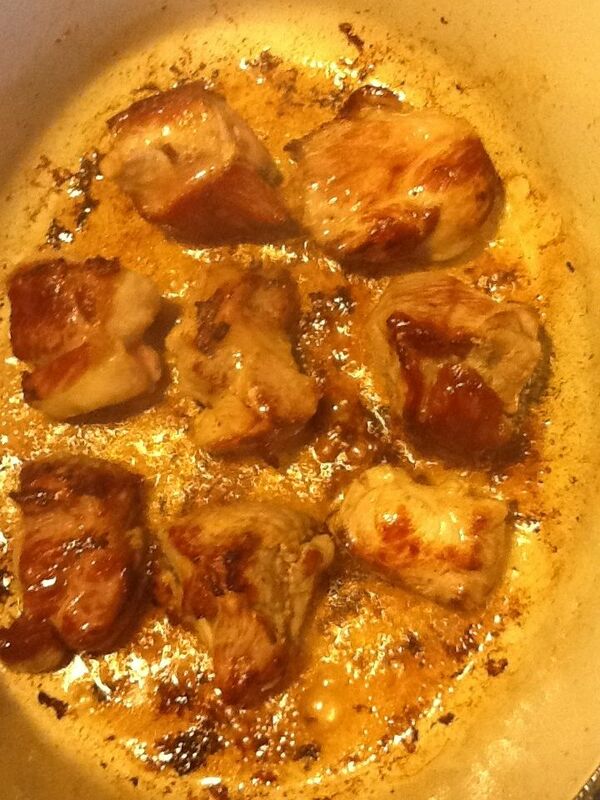 You just want to sear , not cook the pork all the way through. Remove the pork from the heat and set aside. If you have any bones, sear them as well. 3. 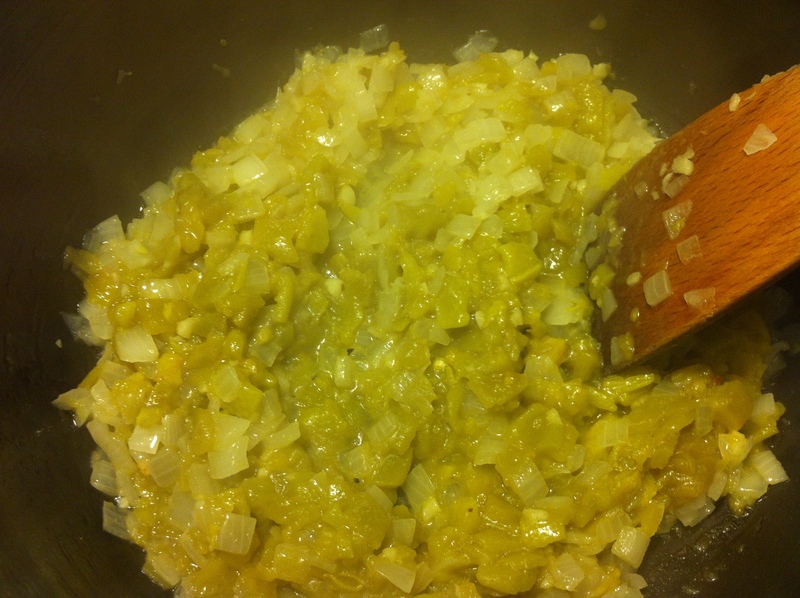 Add the onion and garlic to the stockpot and cook until the onion begins to soften, about 5 minutes. 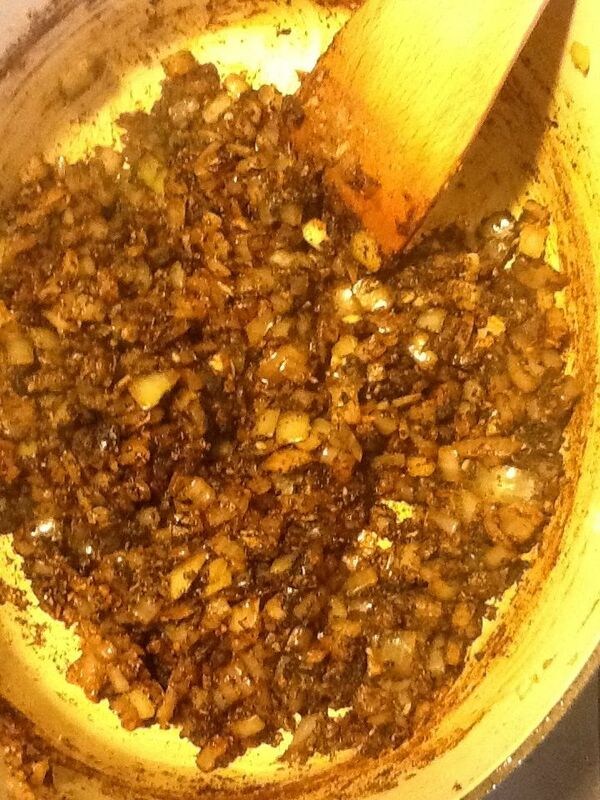 The moisture from the onions will help to release all those browned goodies stuck to the bottom of the pan after the meat has been browned. 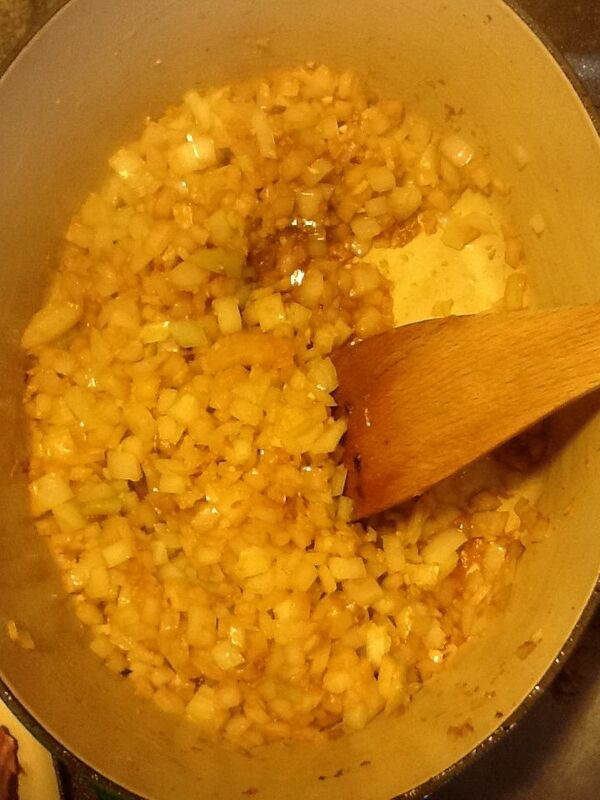 Browning the onions and garlic. Note the clean pan bottom. 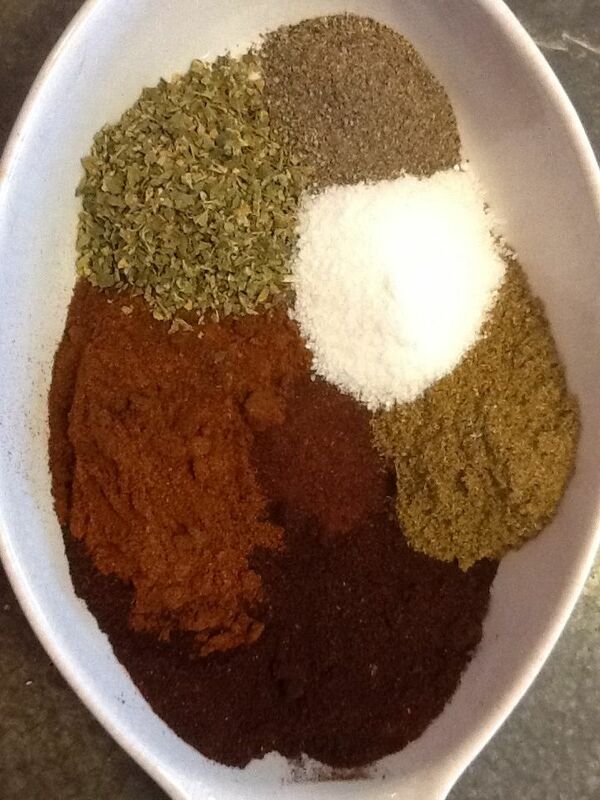 Add the chile puree or chile powders and the other spices. Cook another 2 – 3 minutes, stirring frequently. Be sure not to burn the spices. 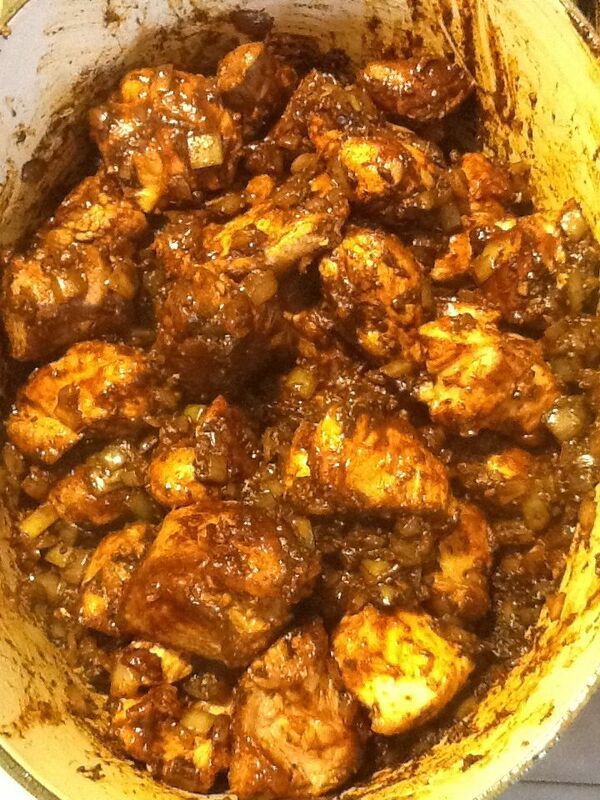 The onions and garlic with the spices. 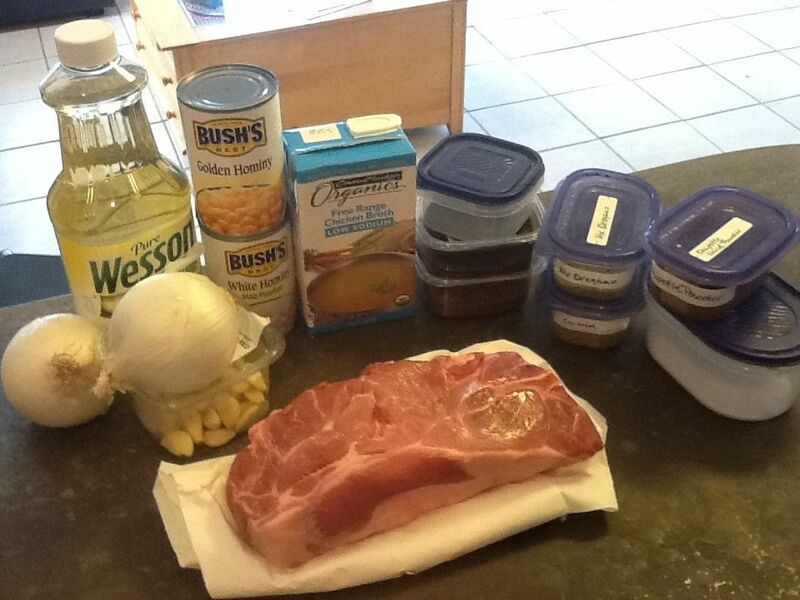 The pork added back to the pot and mixed with the onions, garlic, and the spices. After adding the chicken broth. Adding the hominy after the first hour of cooking. 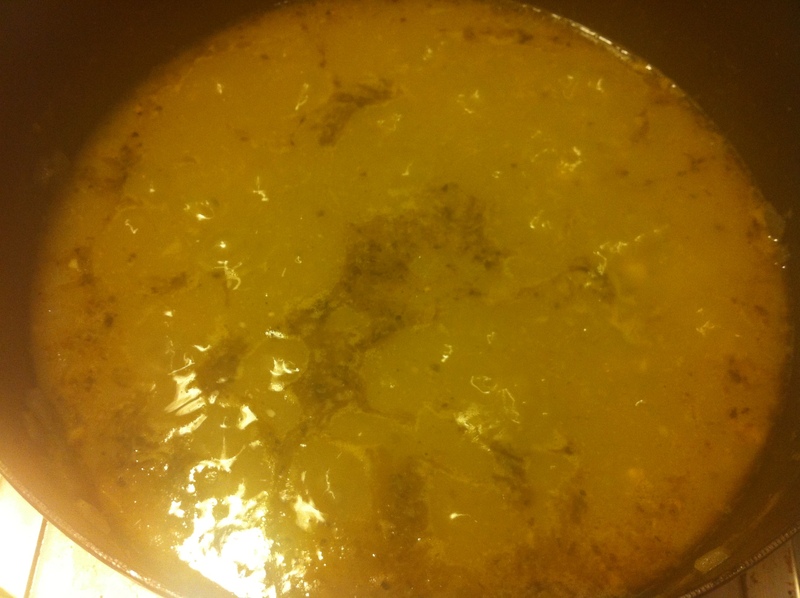 Note the change in color of the broth. Remove the meat from the broth and set it aside until cool enough to handle. Discard the bones, if you have any. Either chop or shred the meat and add it back to the broth. Taste for seasoning. The finished posole. 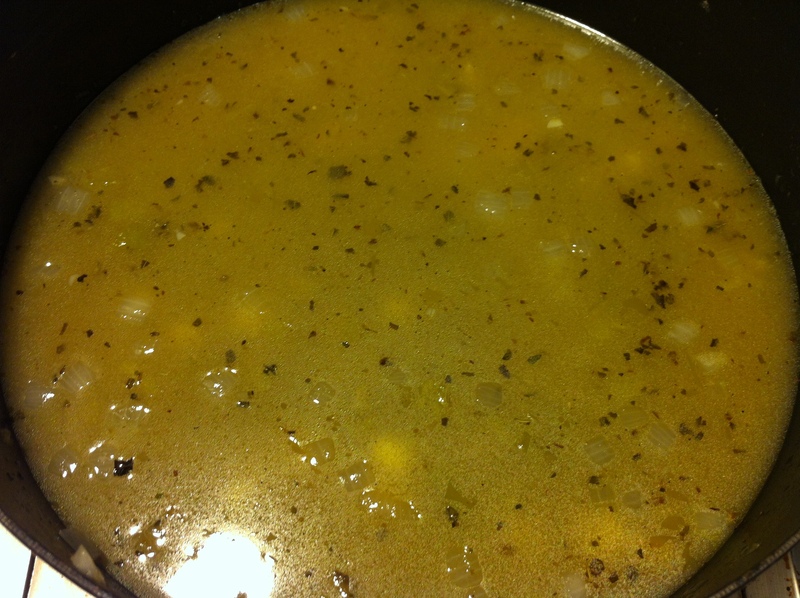 The hominy helps to thicken the broth. 6. Serve the posole with corn tortillas. Pass around the garnishes and let everyone serve themselves.